Categories: All, Machine Guard Systems, Protective Unit. 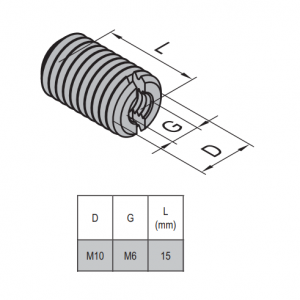 This product is a BUSHING PG40 M8. 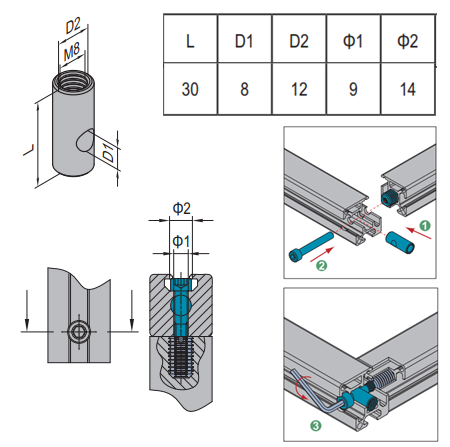 The product gets used to quickly install clamping profiles by making use of other connecting elements. A hole reducer bolt & regular M8 bolt is used to connect another profile at 90 degrees. The product slides into the hole of the clamping profile, along its length. Then, the hole reducer bolt is screwed into the open hole of another clamping profile. The two profiles are then placed against eachother at 90 degrees and an M8 bolt is screwed through the product into the hole reducer to connect the profiles at 90 degrees.